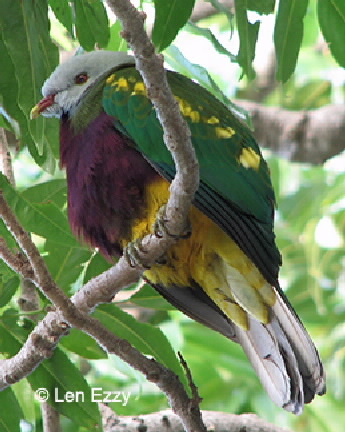 This pigeon normally occurs in rainforest areas where there are plenty of palm trees but it is now spreading into urban areas and has been found as far south as Townsville, after events such as a major cyclone. 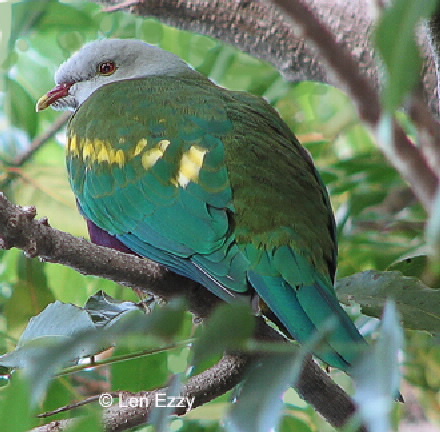 Head and neck are a light grey colour, but the body is predominately green with a golden band across the wings, the breast is a plum-purplish colour and the abdomen is yellow. Legs and feet grey, eyes red around the black iris, bill yellow.